One of my favorite things in the world is the road trip. I like that you can see a lot fun landmarks and discover new activities while on the road. Plus, a road trip offers a certain amount of flexibility that you won’t find when you are required to meet a certain schedule to catch your plane. Your first step is to look ahead to your route and identify discounts. Do you belong to a loyalty program associated with hotels along the way? Stay for free if you have enough points, or use your road trip as a way to rack up the points that can be used on future trips. You can even use travel apps on your mobile device to find last-minute deals as you travel, looking for lodging each night, rather than booking ahead of time. It’s also possible to sign up for city-specific daily deals and then reap the benefits in discounts on local activities. Or, contact the local Chamber of Commerce or Visitors’ Bureau. You can usually get a list of free and low-cost attractions and activities to enjoy while on your road trip. 2. Keep your car in good shape. One of the best ways to save money on a road trip is to take good care of your car all the time. Keep up with maintenance, and keep your car clean and cared for, and you’ll get better gas mileage. You’ll also have a better chance of avoiding breakdowns. I’ve had my car towed 40 miles out down a dirt road (although that was the result of hitting a big rock, and not poor car maintenance). That’s about expensive as it gets when it comes to road trips. Keep your car in good condition and drive defensively, and you’ll avoid costly breakdowns. Growing up, my parents always stocked a cooler full of food for our road trips. If we needed to restock, they drove into town to look for a grocery store, rather than buying expensive items at a gas station. Ice could be replaced at the hotel. Frequently, my parents brought the little hibachi along as well, providing us with the means to cook hot dogs and other foods in a park, rather than having to pay for food at a restaurant. Bring some of your own food, and you’ll save money while traveling. The cost of souvenirs can really add up. Not only that, but they can take up a lot of room in your car â€“ and your home after the trip is over. Instead of buying expensive souvenirs, I like to buy a postcard that can be kept with other postcards in a shoebox. We also buy a single fridge magnet, something that’s a fun thing for our family to do. You don’t need a lot of fancy souvenirs. Take pictures and you’ll have good memories without the cost and the clutter. I have yet to get into this as a way to save money on lodging. However, it’s a good alternative. Bring a tent (or be willing to sleep in your car), and you can pay $10 to $25 a night for your lodging, instead of paying $60 or more for a hotel. Some campgrounds even have showers (you might have to pay $3 to $5 for their use). If you are adventurous, this can work out well. What do you think? 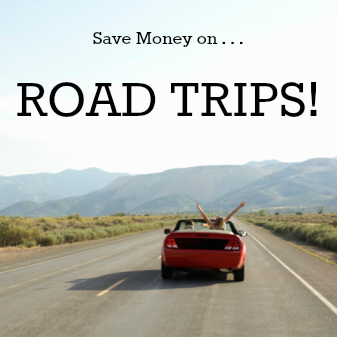 How do you save money on a road trip? Leave a comment! Thanks for a very detailed article. You can really enjoy your trip on a low budget without having to sacrifice the important things. One of the important things is to make sure expenses will be covered in case of an unexpected occurrence such as accidents. One smart way on how to spend your money on a trip is acquiring a travel insurance. There are companies that helps you compare travel insurance rates on their websites to make things simpler. You just have to browse their websites to know more. Lastly, the most important thing is having to spend money on a place that you and your family would surely cherish. Memories are far more important than buying expensive souvenirs. I am really not a fan of souvenirs. One t-shirt is enough. When I plan my trip, I always look for discounts. That’s what I’ve learned from my frugal loved ones. However, I only bring my own food when I go on a trip with family or friends. My family always took road trips with our RV. We rarely dined out and always packed a cooler full of cheese and crackers, fruit and other snacks. We didn’t load up on tchotchkes but I do have coffee mugs and sweatshirts from places we visited. Flying is convenient but you do miss out on adventures between destinations!